This vintage Navajo Indian stamped arrow, man and other designs silver and 22 turquoise round cabochons cuff bracelet measures approximately 5-1/2" around the inside of the bracelet plus a 1-1/16" gap. Measures approximately 5/16 in width. This is sterling or a slightly lower grade of silver. 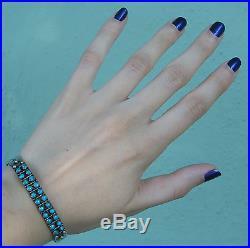 The item "VINTAGE NAVAJO INDIAN SILVER TURQUOISE DOUBLE SNAKE EYE ROW BRACELET" is in sale since Monday, April 01, 2013. This item is in the category "Jewelry & Watches\Ethnic, Regional & Tribal\Native American\Bracelets".